Johnson Properties Realtors & Auctioneers, Inc. » Classic Car Collectors & Restorers Auction! 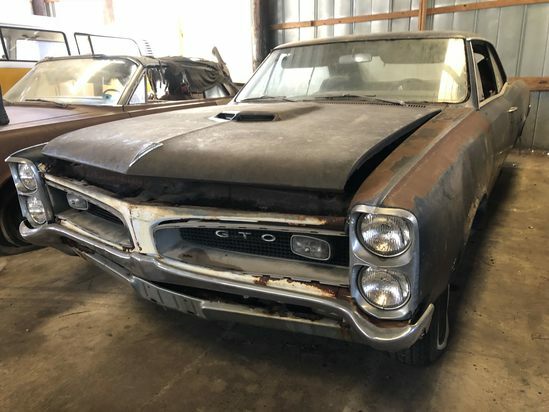 There are over 40 classic cars in this ABSOLUTE auction, in various states of repair; Pontiac, Ford, Dodge, Chevrolet, Triumph and more available. NO TITLES convey w/ the cars; bill of sale only. Payment Instructions: THERE WILL BE A SKID STEER AVAILABLE ON AUCTION DAY FOR LOADING ASSISTANCE! This is an ONLINE on Proxibid and LIVE SIMULCAST AUCTION. The live event will start Thursday February 21st at 11:30 AM EST. The live auction will be held at 13373 US Hwy 64 Alternate, Rocky Mount NC 27801 and be simulcast on Proxibid. PLEASE READ ALL OF THE TERMS AND CONDITIONS BEFORE BIDDING. BY CHOOSING TO BID IN THIS AUCTION YOU ARE AGREEING TO ALL OF THE FOLLOWING TERMS AND CONDITIONS AND AGREEING TO HONOR THEM. Participation Requirements: Valid Credit Card required for bidding approval by Proxibid. PLEASE REGISTER WITH THE CREDIT CARD YOU WILL BE USING FOR ANY AUCTION PURCHASES. Any changes to the credit card on file for purchases must be done through Proxibid Customer Support at info@proxibid.com or call, toll free, at 1-877-505-7770. Accepted payments: Credit Cards, Cash, Certified Check, Money Order, Wire Transfer ($20.00 Transfer Fee) Online Buyers Premium: Online Bidders that pay with a credit card will have a 16% Buyer's Premium. Online Bidders that wish to pay with cash, certified check, money order, or wire transfer will have a 13% Buyer's Premium. Wire transfers are accepted same as cash with a 13% buyer's premium PLUS a $20 transfer fee. Please call the office at (919) 639-2231 and speak with Stephanie for the details. For invoice totals over $2000, purchases must be made with cash, certified check, money order, or wire transfer. Please call the office at (919) 639-2231 ext.230 and speak with Stephanie for the details. To prevent your credit card from being charged, buyers wishing to pay by cash, certified check, money order or wire transfer must notify Stephanie at (919) 639-2231 ext 230 or e-mail her at admanager@johnsonproperties.com by Thursday, February 21 by 4:00 PM Eastern Time. All credit cards will be charged via Proxibid Thursday, February 21 by 4:30 PM Eastern Time unless the above mentioned arrangements have been made. Any changes to the credit card number on file for purchases with Proxibid must be done through Proxibid Customer Support at info@proxibid.com or call, toll free, at 1-877-505-7770. You must bring your "PAID IN FULL" receipt to pick up your items. Paid in full credit card receipts will be emailed to the winning bidders on Thursday, February 21 by 5:00 PM EST. All other payment methods will be presented with their paid in full receipt after payment is received. Please refer to the event details for pick­ up and shipping information. If payment is declined Johnson Properties Realtors & Auctioneers, Inc. will file a non-paying bidder complaint with Proxibid and resell the items at the original buyer's expense. Defaulted bidders will be black-flagged in our database as a Non-Paying Bidder. Johnson Properties reserves the right to sell to the next highest qualified Bidder and/or Buyer in the event the successful high Bidder and/or Buyer does not comply with the terms of the sale. By bidding on the items in the auction, the Buyer agrees to all terms and conditions set forth. By registering and placing a bid, you agree that if you happen to become a Default Bidder or Non-Paying Bidder, Johnson Properties has the right to charge your credit card for the entire balance of your invoice. If Johnson Properties is able to sell your item to the next highest qualified Bidder at a price lower than the auction high bid price, the Default Bidder agrees to allow Johnson Properties to charge their credit card for the difference in their high bid price and the actual selling price to the back-up Bidder. All purchases must be picked-up/loaded by the bidder or their designated agent during published check-out dates and times. No items will be released from the auction site without a valid paid invoice. NO EXCEPTIONS. Shipping Instructions: THERE IS NO SHIPPING AVAILABLE THROUGH THE SELLER OR THE AUCTION FIRM. BUYERS MUST MAKE THEIR OWN SHIPPING / HAULING ARRANGEMENTS. Removal is at the expense, liability, and risk of the purchaser. Lots will be available for pick up only upon the presentation of the paid bill. This is an ONLINE & SIMULCAST AUCTION; PLEASE DO NOT BID IF YOU ARE NOT ABLE TO PICK UP YOUR ITEMS during the scheduled removal times; NO refunds or charge back's will be granted due to a lack of removal at the designated times. Johnson Properties accepts no liability regarding shipping and is not liable in any event for non-delivery. You've been outbid to 4****n! to YOU! You've been outbid to k****c! to YOU! You've been outbid to c****h! to YOU! You've been outbid to o****i! to YOU! You've been outbid to j****g! to YOU! You've been outbid to P****Q! to YOU!